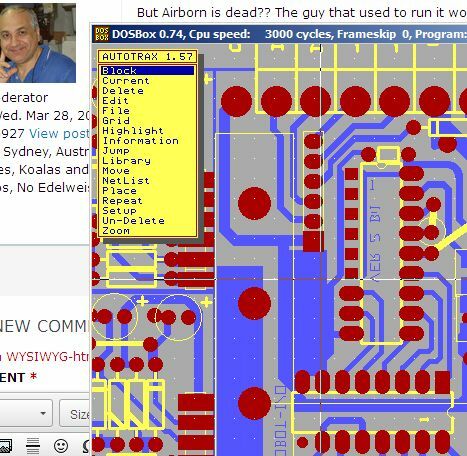 » Which software is best for PCB design? Which software is best for PCB design? As a professional electronic student, I need to learn how to design PCB. Is any one can give me some suggestion about the software? Note: Free software!!! Is If you are a real Sicilian then Kicad is free and it seems that many people use it and is improving all the time from what I hear. I tried it a few years ago but then I gave up, I purchased a package that could import 20+ years of PCB if needed. One of these days I may have another go at it just for fun. Best is in the eye of the beholder. Very much like "best IDE" or "best computer language". Could you send me a link? Some would argue that "best" and "free" are mutually exclusive! But, surely, if you are a "professional (sic?) electronic student" then you have tutors who can make recommendations for you? Surely the best for you is going to be to use whatever will be taught in class ? Go on - you're a student; do a bit of studying! 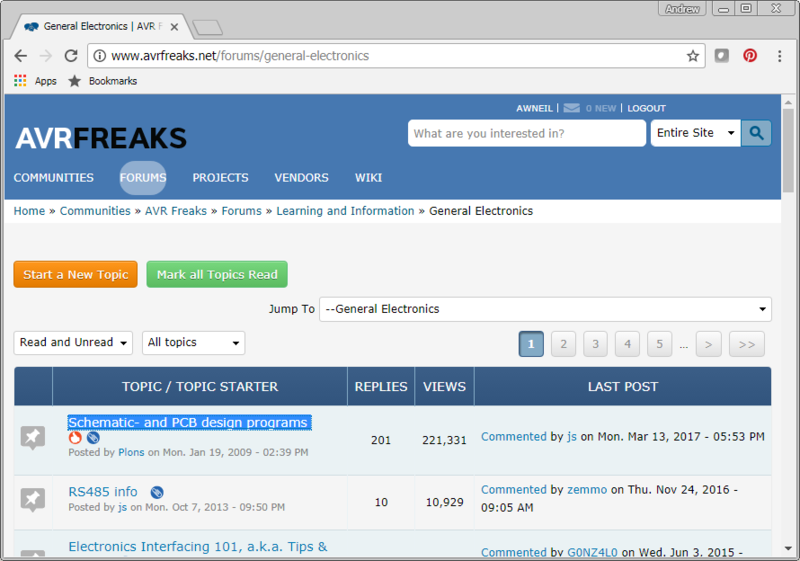 jgmdesign told you there's something in the GENERAL ELECTRONICS forum - did you go and look? Just a note to the community members. TOP and SICILY are the same person based on IP address. They could also be two students in the same class as well. Agreed. Both accounts are candidates for being banned if no explanation is offered promptly. One account has email address at allpcb.com while the other is a hotmail one. If the two accounts thing does not already ring alarm bells I would have thought that was the definite trigger? Not sure whether to suggest banning the two accounts and deleting all trace of their posts or maybe leave them so others can see what shabby business practices allpcb.com go in for if that is what is really occurring here? So that seems pretty unequivocal to me. Just a note to the community members. TOP and SICILY are the same person based on IP address. Remember that IPv4 addresses are getting scarce and lots of companies and organizations use NAT. Many, many people in an organization or university could all have the same IP address. They could also be two students in the same class as well. Students in a rented appartment sharing the same internet connection? For me KiCad ticks all the boxes which make it usefull and a lot which made me love it. And it does'nt tick any boxes which would be show stoppers. I've used 10+ different PCB design suites over 30 years and KiCad is the best untill now. What do you think of a PCB package that if you delete a connection in the schematic you get visual confirmation it's deleted, but the connection is not removed from the netlist, so it's still there when you draw the PCB? And paid EUR150 for that piece of crap. Yuch. After using "FreePCB" for years, it took me some time, like an afternoon, to catch onto KiCad and love it. There are many more free software in the wide market of electronics but the listed softwares are the top 5 softwares which we can use free of cost. Oh, please don't recommend Fritzing....! Also, I think there is a big difference between free, and crippled trials and vendor tied versions, but never mind. Listing some of the best? By what measure if I may ask? Fritzing is not even a pcb design software. Designspak is not free. You pay for it when you try to order pcb's. Never heard of "Free PCB". Listen to Torby. KiCad rules. Listen to Torby. But Airborn is dead?? The guy that used to run it works for an insurance company from what I gather. "But Airborn is dead?? The guy that used to run it works for an insurance company from what I gather." I used Schedit, and Autotrax for many years but could never master producing Gerbers out of that, still have in on my old Xp machine. Sometimes I would send the file to Steven from Airborn to get the Gerbers as he was working on an easier program to produce them. Then I purchased RIMU PCB and schematic and never went back, it will import Protel PCBs and produce Gerbers easily. Thank you js for RIMU , I downloaded it. It is practical. But at drawing, it looks dull and dead. No short keys, no zoom when the track is involved with cursor. What did you expect for free? Also did you look at the sticky I mentioned earlier? Now that Eagle got bought out, I really need to get in and really learn KiCad. I have it installed on my machine and did some tinkering awhile back with the schematic editor but have yet to do a board layout. I have a few breadboard prototypes I've got that are almost ready for a board layout. I should do some of the simpler ones as a learning process. Now that Eagle got bought out, I really need to get in and really learn KiCad. Follow the "getting started guide". It wil guide you through the whole process from dawing a schematic to generating gerbers. Their forum has some integrated mail notification system, which means that if you post a question it's often answered within a few minutes. I will definitely check that out. My process for learning new applications has always been "just figure it out by doing stuff" but the busier I get with projects, the less time I have to "just figure it out" and guides start to become more helpful. I don't know if there has been any updates lately, probably not. Maybe I'll send them an email but don't know if a get an answer. You can also take the help from these free software. Perhaps it's time to lock this one, and keep further "contributions" in that STICKY thread ... ? Untill ANOTHER thread is created....and another?